Power Generation « Global Market Insights, Inc.
With the rising acceptance of renewable energy sources as a means to derive power, thermal energy storage market has emerged as one of the top-notch verticals of the sustainable ecosphere. The demand can also be cited to be driven by the reducing dependency on fossil fuels as an energy source, primarily due to their innumerable hazardous impacts on the environment. As per reliable reports, primary energy consumption is expected to rise by more than 45% by 2040. It is rather obvious that thermal energy storage which plays a balance between the growing energy demand and the need to address the environmental interruptions will constitute a major ratio of the sustainable energy mix. Speaking of the widespread application portfolio, utility and electricity generation is one of the most lucrative end-use arenas for the thermal energy storage market. The technology has gained massive popularity via its adoption in CSP plants where solar heat is stored to generate electricity that can be used at night, providing relatively affordable, cleaner, and uninterrupted power supply. It is prudent to mention that the residential and industrial sectors, where the technology is being widely utilized for cooling or heating applications as well as power generation, is yet another potential end-use avenue for the thermal energy storage industry. Reports from the International Renewable Energy Agency (IRENA) cite that, in Europe, around 1.4 million GWh/year of energy can be saved, and 400 million tons of CO2 emissions can be avoided, in residential and industrial sectors by extensively using heat and cold storage technologies, figures that identify the growth and profitability potential of thermal energy storage market over the coming years. The energy-saving potential by deployment of this technology is vivid globally, although the rate of penetration of thermal energy storage market varies with different geographies. A series of parameters including the demand ratio, regulatory mix, and infrastructure support are some of the vital parameters responsible for the change of dynamics related to thermal energy storage industry expansion across the regional spectrum. With heavy R&D investments and high fuel costs, U.S. thermal energy storage market is estimated to register a lucrative growth chart over the coming years. In the year 2017, nearly 41.8MW of energy storage systems were installed across the region, which accounted for 46% of y-o-y growth. In addition, reportedly, 14 U.S. states have deployed around 2GW of energy storage into Integrated Resource Planning (IRP), highlighting the growing popularity of energy storage technology in the region. 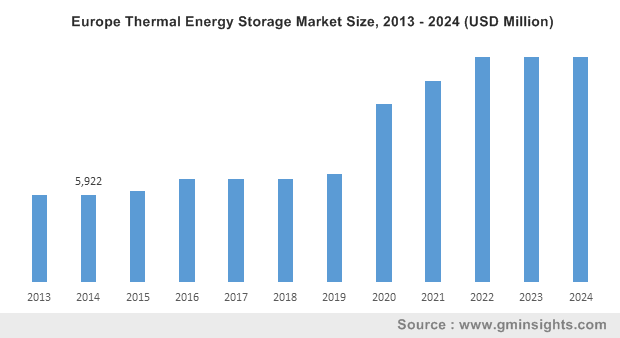 As per a report by Global Market Insights, U.S. thermal energy storage market share stood at USD 6 billion in 2017. With heating and cooling using approximately half of Europe’s energy, the demand of thermal energy storage industry in the region is estimated to be substantially high over the coming years. As per European Association for the Storage of Energy, 50% of all final consumed energy in Europe is used to heat buildings or water. Out of this, 85% still comes from fossil fuels, hinting toward the potential opportunities which are yet unexplored in the region. Add to this, the regulatory landscape aggressively boosting the demand for renewable integration to attain the vision of a decarbonized economy will further provide a substantial impetus to Europe thermal energy storage market. With the expanding infrastructure sector and rapid economic development, China is slated to be yet another profitable avenue for the thermal energy storage industry players. The region is actively investing in energy storage technologies with a vision to meet its energy as well as environmental sustainability demands. Reportedly in the first half of 2018, Henan, Qinghai, Jiangsu, and Guangdong provinces declared the construction of energy storage projects of varied capacities totaling 340.5 MW. In yet another instance, Suunpower, China’s CSP developer last year signed a partnership deal with Norway’s EnergyNest to deploy TES systems in China. The EnergyNest system would facilitate an affordable and eco friendly energy generation eliminating the hazardous impact of coal combustion on the environment. In a nutshell, it is rather evident from the aforementioned facts and trends, that although the TES technology has penetrated appreciably at a global scale, its full potential is yet to be explored. A trend that is anticipated to change and characterize the dynamics of thermal energy storage market is the high technological developments and R&D investments focusing toward energy efficiency and environment sustainability. In terms of profitability matrix, analysts project the worldwide thermal energy storage industry to surpass a revenue of USD 55 billion by 2024. This entry was posted in Sustainable & Smart Technologies and tagged Commercial, District Heating & Cooling, Global Thermal Energy Storage Market, Industrial, Latent Heat, Molten Salt, PCM, Power Generation, Process Heating & Cooling, Residential, Sensible Heat, Storage Material, Thermal Energy Storage Industry, Thermal Energy Storage Market, Thermal Energy Storage Market Report, Thermal Energy Storage Market Size, Thermochemical, Utility, Water.